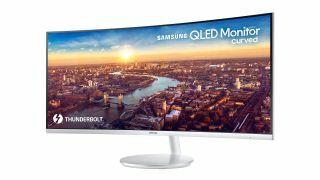 Samsung has revealed a new monitor it will be showing off at CES 2018, and the 34-inch panel will be the first curved model to boast Thunderbolt 3 connectivity. The Samsung CJ791 is an ultra-wide (21:9 aspect ratio) curved monitor with a resolution of 3,440 x 1,440 and a 1,500R (relatively sharp) curvature. It’s a QLED panel which offers deeper blacks and brighter whites, and the company boasts that it ‘precisely reflects colors across a 125% sRGB spectrum’. You’ll get plenty of contrast and vibrant pop with the image, in other words, and viewers will also benefit from a 178-degree viewing angle. As mentioned, the CJ791 sports a Thunderbolt 3 port and has a height-adjustable stand, as well as tilt adjustment, and a nicely slim bezel. Samsung is aiming this at both business users – touting the large display’s suitability for multitasking with all that screen real-estate – and gamers, with the monitor having a 4ms response time. There’s also a ‘game mode’ which uses dynamic gamma settings to intelligently adjust color and contrast on-the-fly for the best results. Pricing and availability of the monitor is still to be confirmed, but we shouldn’t have to wait long for those details – indeed we may hear more at CES very shortly. Of course, we’ll update this story if that’s the case.